Today’s Pitzer College is a remarkable place without intellectual limitations or physical boundaries, where students challenge themselves and discover inspired futures. We pride ourselves on creating personally transformative student experiences through small classes, world-class faculty and our proactive community of learners and leaders. Now more than ever, each individual gift to Pitzer is essential. It is though the generosity of our donors that we have the resources to expand this extraordinary educational undertaking and truly make a difference in the many lives it touches. 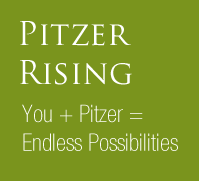 When you make a gift to Pitzer, you have tremendous flexibility in determining how the funds will be used. Each one is important and up to you. Gifts can be directed, or restricted, to a specific program or College giving priority that is meaningful to you. Unrestricted gifts are among the most valuable to Pitzer College as they are used wherever the need is greatest and allow the President to say “yes” to unique opportunities as they arise. You may direct your gift for current use, a contribution that is put to work immediately, or for the endowment. Endowed gifts are pooled together and invested in perpetuity to provide a reliable, long-term source for faculty positions, student scholarships, academic programs and other priorities. Affordability opens doors and makes dreams possible. The minimum gift to establish a Named Scholarship Fund directed toward a Pitzer college major or containing other specific scholarship-recipient criteria is $100,000; an Endowed Financial Aid Award, which provides need-based support for any admitted student, is $25,000. Pitzer is organized by field groups rather than traditional departments. With a faculty-to-student teaching ratio of 10:1, many funding opportunities exist in support of the innovative programs, leading-edge curriculum, research endeavors, cultural activities and community engagement that the field groups advance. The minimum gift to endow a Faculty Program Fund is $25,000 with its designated use managed by the specific field group or interest area it benefits. Contact the Office of College Advancement for more information.